Earth’s Mightiest Heroes recently took a break from their world-saving duties to welcome the great Stan Lee onto the set of Avengers: Infinity War. 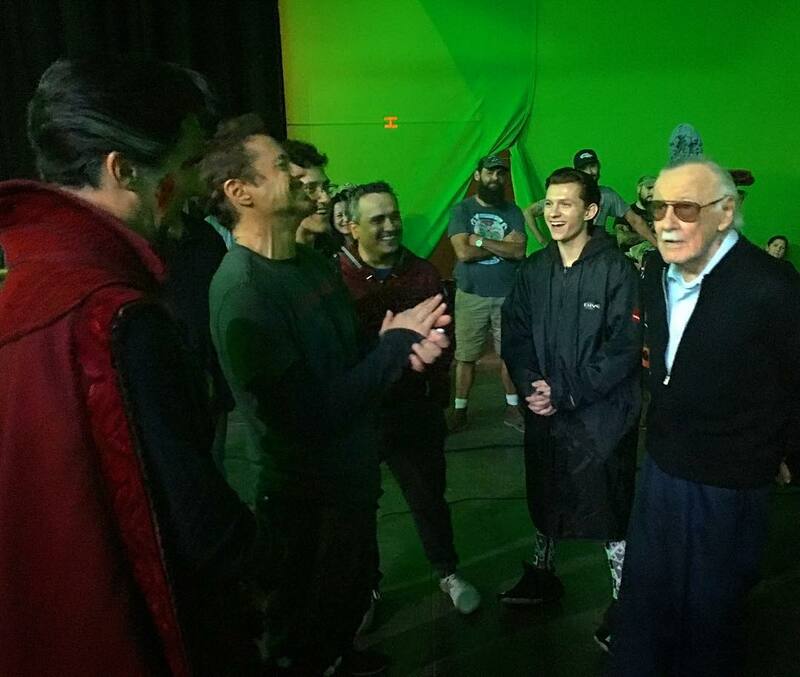 Still incubating in the bowels of development ahead of its release in May of 2018, Robert Downey Jr. (Tony Stark/Iron Man) took to Instagram just yesterday to share a rather heartfelt behind-the-scenes photo of Stan Lee greeting Doctor Strange himself, Benedict Cumberbatch, along with Spider-Man: Homecoming‘s Tom Holland and co-directors Joe and Anthony Russo. It’s a picture that takes on a greater meaning in light of Joan Lee’s death early last week. The late voice actress had been married to Stan Lee for almost 70 years, and her death sparked an outpouring of support from both the industry and Marvel’s impassioned community. And though Downey Jr.’s Instagram post doesn’t mention Joan specifically, the MCU stalwart does take a moment to acknowledge Stan Lee’s historic contribution to the comic book industry, writing, “I owe it all to you.” We’re not crying, you’re crying! As for the photo itself, it’s fairly nondescript. Previous reports have indicated that Guardians of the Galaxy Vol. 2‘s James Gunn has already shot Stan Lee’s cameo for Avengers: Infinity War, so chances are the living legend simply paid a visit to the movie’s Atlanta set to see how things are proceeding. It’s filming simultaneously in the city with Ant-Man and the Wasp, and there’s a very good chance that Marvel will bring one (or perhaps both?) films to San Diego-Comic Con in little over a week’s time.